The anemone plots at Coal Oil Point consist primarily of the solitary anemone, Anthopleura sola rather than the colonial anemone Anthopleura elegantissima (note that these were considered a single species prior to the past several years and they are not distinguished in our sampling methods). Cover of Anthopleura has undergone a gradual decline from around 25% in 1992 to less than 10% in 2010 with cover estimates interrupted every few seasons by periods of near complete sand burial. Aside from sand, the dominant taxa occupying these plots are species of filamentous red algae which have been lumped with a few other seldom-encountered species into the "other red algae" category. Red algae have fluctuated wildly in relation to sand burial, though in recent years they seem to have become more stable in the 40-50% cover range. Alternatively, bare rock and the ephemeral alga Ulva both increased in cover after 2008, though Ulva has declined again in recent seasons. Mussel plots were added to this site in the fall of 2003. Since that time, the mean cover of Mytilus declined initially from around 80% to around 60% by the fall of 2004, but has remained generally steady in the 60-70% range thereafter. Mussel cover is currently at the lower end of the range at 54% in fall 2014. Much of the decline is the result of a single plot in which a mussel breakout gave way to an open patch of rock and barnacles that has persisted since that time. Annual motile invertebrate sampling has occurred in these plots since their inception (always in the spring, though with an additional sampling in the fall of 2003). Limpets along with Nucella spp. and Tegula funebralis snails have undergone slight fluctuations during this time, until the dramatic increase in Tegula in 2010. The mean cover of Surfgrass (Phyllospadix) has fluctuated widely throughout the years at Coal Oil Point with seasonal variation (lower in spring, higher in fall) along with intermittent periods of sand burial. Throughout the years, the cover of Phyllospadix hovered around the 60% to 80% range. Dips below that level were the result of sand burial, rather than plant and/or rhizome loss. Even where leaves were lost the plants would quickly regenerate from the rhizomes upon emergence from burial. Beginning in 2003 the seasonal pattern began to break down and surfgrass cover increased steadily until 2005. 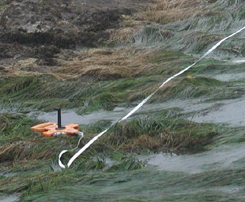 Seasonal variation returned in 2006, but then in 2007 the surfgrass population crashed in the absence of sand burial, and this time there was extensive rhizome loss as well. Mean surfgrass cover declined to almost zero by the spring of 2008 and has recovered slowly since that time. Filamentous red algae and bare rock increased in the wake of the surfgrass declines. As of fall 2014, Phyllospadix cover was back over 40%.. In the time since this site was established in 1992, the numbers of sea stars at Coal Oil Point have never been high enough to warrant the establishment of permanent plots. 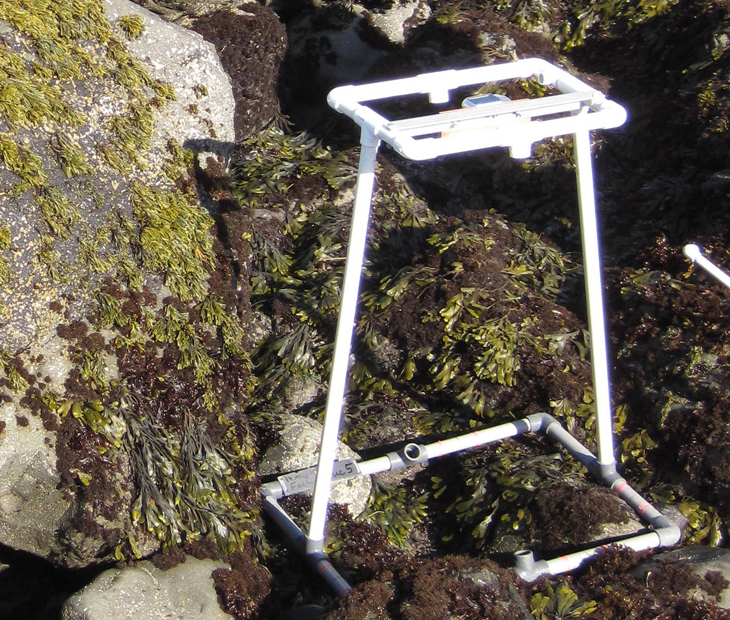 However, sitewide searches for sea stars have been performed each sampling event since the spring of 2010. 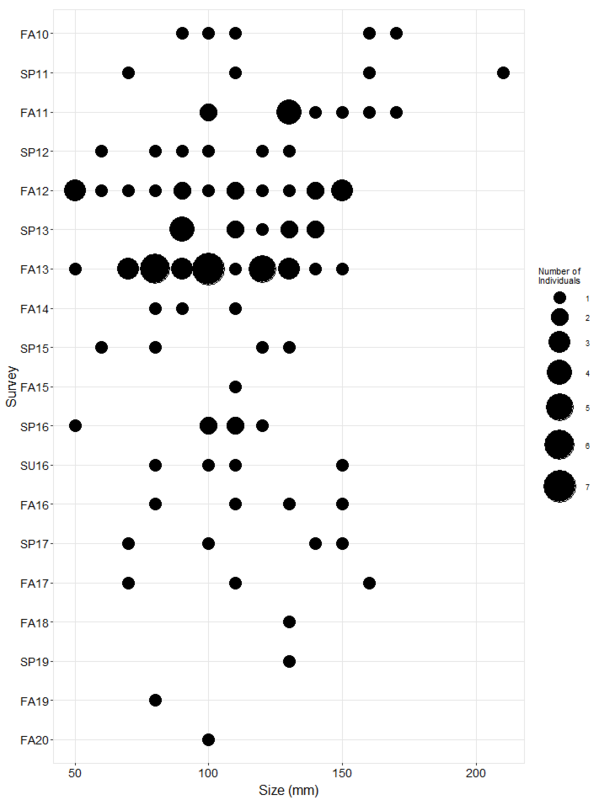 Between 5-10 stars were found in each of the first five sampling seasons. 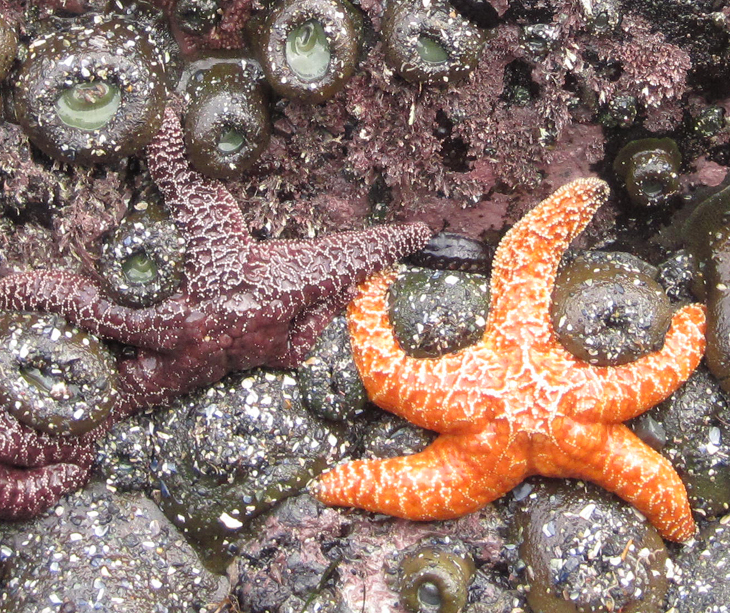 Then over 15 stars were found in the fall of 2012 and in the fall of 2013, when the seastar wasting disease was starting to spread in Santa Barbara County, over 30 stars were found. One of those stars in fall 2013 was recorded as diseased as it contained a small, though questionable, lesion; all other stars appeared healthy. But then all the stars were gone by the next sampling event in spring 2014 and no stars were found in fall 2014 either. Smaller stars (<50mm) have yet to measured at Coal Oil Point. Movement of stars in and out of the subtidal, rather than recruitment, seems to be controlling the size and numbers of stars found at this site.